When I think of life and death I sometimes imagine opposites, or different poles on a spectrum. How different are life and death. Of life, we are experts and of death we know nothing. But that isn't true at all. In fact, for me the more I encounter death in its many forms, the more I appreciate life, all life. So it is with great humility that I look closely at my own garden, not only for what I can learn about sustainable agriculture, but also for the lessons in life, and the sustainability of Family. 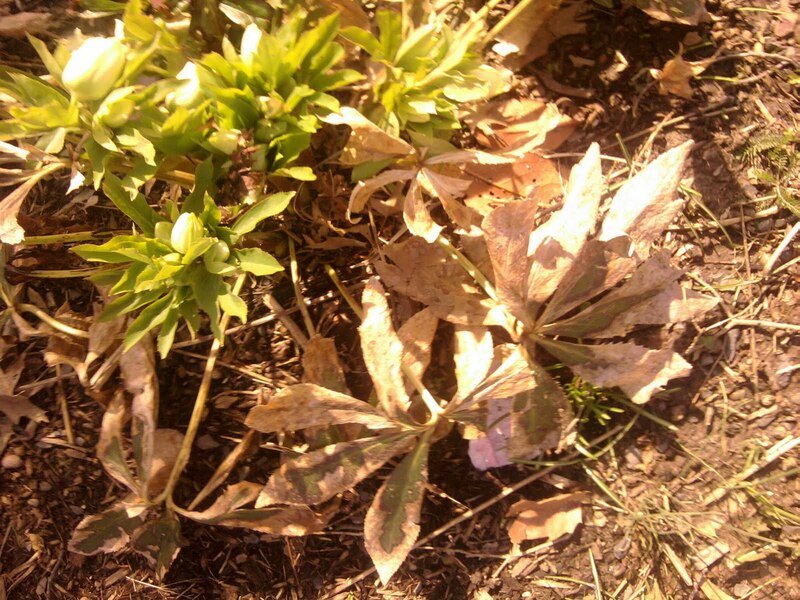 All winter I saw the brown, worn leaves of the Helebors in my garden. I would walk past and think, "Should I cut them off?" "How far down should I cut?" "Perhaps I should just wait until Spring and leave them in place." Days and months pass and snow covers the dead leaves. Yet, knowing as I do that the Helebors will be among the first flowers to bloom,I decide to wait. I've been through the cycle, I know how and when to anticipate the new growth, yet I chose not to cut back the leaves over the winter. I recently looked at the place along pathway from our front door that I walk each day and saw the Helebor in bloom, right in with the dry, brown leaves. It was a moment, cherished. Seeing literally within the old leaves the new beautiful blooms. Camera. Pencils. Paints. Pause to appreciate. Tomorrow I will visit my grand daughter's kindergarten to introduce them to "healthy gardens." I will be bringing seedlings of lettuces and herbs and seeds to grow squash and cucumbers for planting after we build a raised bed. I will ask them what they know about how vegetables and flowers grow. I will ask my grand daughter to tell them how we planted the peas in the garden last week. I will ask them if they know where, and how we get the seeds. Then I will review with them what they learned about the third day of Creation- the Biblical phrase, "Let the earth sprout forth sprouting plants yielding seeds." The Ramban says that the phrase 'let the earth' is used because it means that God created the earth with the potential to grow and nourish the seeds. That is a good lesson for why we need to pay attention to the soil we use. We will discuss composting on another day. It is not to hard to stay focused on all the actual gardening tasks. Yet, for me, it is my heart that learns of life and death. It is knowing that my grand daughter is named for my own mother, z"l that brings the tears that water that garden within me that I can only call my life force, my neshama. Not a day has gone by in over twenty years that I have not felt my mother's love, presence and guidance. While my tears are personal, my passion is for nurturing all of G-d's children, and working daily to seed His garden with love, Emunah (belief), and Betachon (trust). Posted in family, gardening with children, spirituality on March 29, 2011 by Ruth Feldman. It was so nourishing to be carried into this meditation on life and death and to share your lessons learned from everything. Its a huge mystery and hearing you comment on it is a gift.